“27.08.2011” is a live recording done by two great artists v4w.enko & d’incise. at Tivoli 16, Geneva. 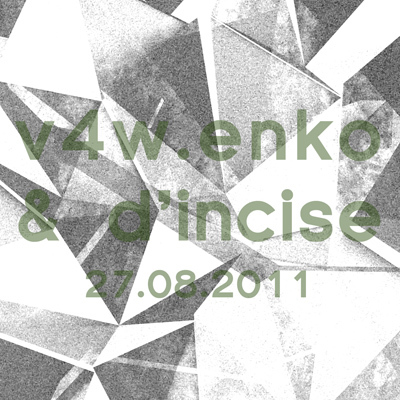 The basis of this work is made with v4w.enko’s algorithmic forms which are confronted to concret gestures by d’incise. The result is a sublime piece of improvisational work, combining deep drones and soundscapes with live treatments of various objects & contact mics. v4w.enko is a project of Evgeniy Vaschenko, based in Kyiv, Ukraine and started 2007 as live electronics, working with sound and visual streams. Sound and video streams are being realised in real time by manipulation of self programmed algorithms. Parts of algorithms have simple forms and are correlated one with another by simple rules. d’incise, born in 1983, is member of the Audioactivity music & visual collective founded in 2000 in Geneva (CH). 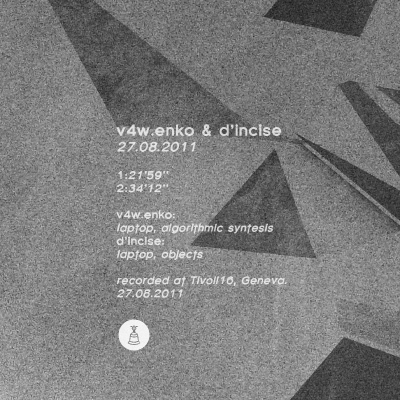 In 2002 he starded to arranges hybrids of electronic music, from dub to electronica, dangerously sliding to the electroacoustic more experimental ways. His world is made with sound fractures, nevralgic crepitations, melancolic atmospheres and a non-dissimulated fascination for rust and faded rhythms. Two spaces, two languages, two focal points, getting so close as synthetical and natural, but never touching. The first space is black & white, minimal and symbolic. It talks about the beauty of color inside the sound and complicated structures but it has not colors in itself. It is a sort of counterpoint, a reference, a cold therory demonstration, a base of reflexions. The second space could show colours of structures and physically complicated sounds. The rules that generate them might be very complex, and though unnecessary to be explain. The human perception comes first, on it’s own, at this level. The first space is more unpretentious and selfgenerateed, the second requires more finely tuned work to take form. But in the end the two spaces are not in conflict. None has more value than the other. They happen separately and simultaniously. The sound reflects this relation, a contrasted proposition between automatic processiong, fixed layer, digital and physical. Live audio in the real time. Live treatments of various objects & contact mics. Max/msp code in algorithmical sounds.